Hi everyone I'm Jack Red, sometimes I am proud to be a Sega fan while others make me question things. Seriously AtGames is making Mini Genesis for it's upcoming anniversary. Are they smoking crack or too many rings? AtGames is known for constantly rereleasing small retro style consoles. The known flaws includes controls being off often with wireless controllers & terrible audio. The kind of terrible audio that makes even the finest master pieces sound like absolute crap I'm not kidding. A while back I reviewed their original Genesis model that still keep rereleasing to this day. 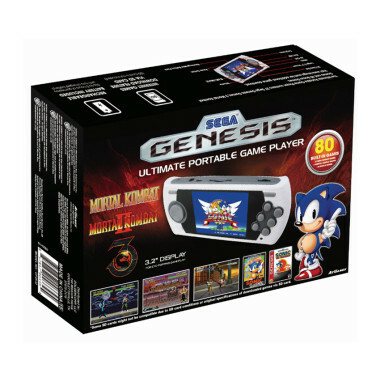 More recently they came out with Sega Genesis Flashback as an answer to both Mini NES & Mini SNES. My model of this handheld actually involves Mortal Kombat 1-3. Thankfully unlike most AtGames Genesis models, you can add Genesis games through a SD card. I felt by adding these terrible homebrew games. They are basically being lazy & too cheap to give us some truly amazing games. If I wanted a homebrew Genesis experience, I would play Wolfenstein 3D on Genesis or Mortal Kombat II: Unlimited. I am likely to review that rom hack in the near future we will see when. Surprisingly the D-pad and the buttons works much better than those horrible wireless controllers. I still prefer using a real Genesis controller or great consoles that has Genesis games. The battery life of it is very good considering the company's reputation. I love almost everything about this thing. I would say this is the definitive AtGames experience that you should try. If you wanted the definitive AtGames experience for doing even the basics wrong. Go check out their usual Genesis models. I also like this thing felt much tougher than that Genesis model I'm not kidding. Believe it or not, according to the manual you could use this as a Genesis to play on your TV. Sadly they didn't upgrade to HTMI cable for newer TVs. I remember as a kid I had Sega Game Gear. In many ways it is better like the screen being much easier to see even in the dark. The buttons are simply done better. Sometimes you need more buttons to do several actions. Attempting to combine them together leaving to much unneeded frustration. You can easily change the volume or wear a headset. I felt audio wise it is better than most AtGames Genesis models. This handheld doesn't get advertise as much as it's other variations. I don't have a lot of negative things to say about this. Sadly some of the games aren't perfect in emulation. Sometimes attempting to beat Mortal Kombat 1 around Goro the game freezes. The overall Mortal Kombat 3 is playing way too fast. So fast in fact I can't choose a ladder at all. You could choose a character with slightly more time. Some games I loaded up have unexpected issues. The actual box has better overall design but trickier to close. The big question is do I even give this a recommendation or not? I sorta do recommend it to those that want to play Genesis games on the go. Interesting enough Sega themselves made Sega Nomad. I haven't got to play one but I heard some good things about it. Believe it or not, you could use Nomad to play Genesis games on your TV too. Although it's battery life is worse than Game Gear's. I would say go pick up one of these up.